Dr. Wise is a Diamond Injector of KYBELLA™ for submental fullness and he is one of only a few doctors in the Wayne, New Jersey area that is currently using the product. Submental fullness due to submental fat, sometimes referred to as “double chin,” is a common yet undertreated facial aesthetic condition. Submental fullness can impact a broad range of adults including both women and men, and can be influenced by several factors such as aging, genetics and weight gain. Submental fullness is often resistant to diet and exercise alone and it can detract from an otherwise balanced and harmonious facial appearance – leading to an older and heavier look. According to a survey by the American Society for Dermatologic Surgery (ASDS), over 2/3 of consumers are bothered by submental fullness – nearly as many as those bothered by lines and wrinkles around the eyes. Clinically Proven, KYBELLA™, (deoxycholic acid) injection, also known as ATX-101, is the first and only FDA-approved injectable drug that contours and helps improve the appearance of submental fullness due to submental fat. KYBELLA is indicated for improvement in the appearance of moderate to severe convexity or fullness associated with submental fat in adults. The safe and effective use of KYBELLA™ for the treatment of subcutaneous fat outside the submental region has not been established and is not recommended. 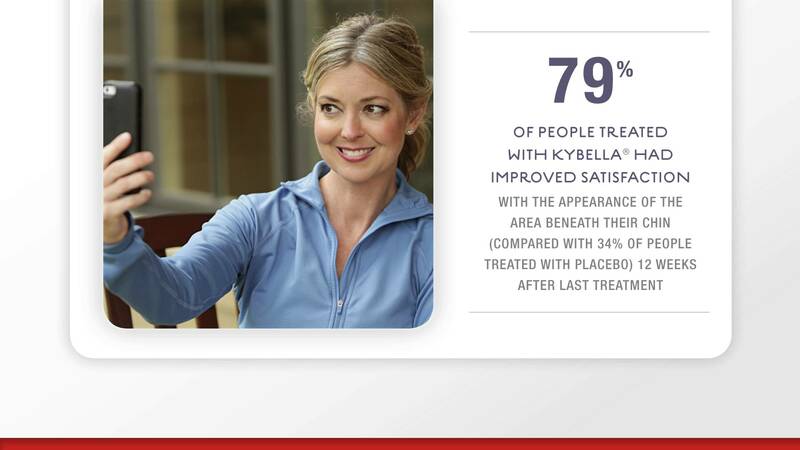 In the pooled, pivotal Phase III clinical trials, 68.2 percent of patients responded to KYBELLA™, compared to 20.5 percent of patients who responded to placebo, based on validated physician and patient measurements. The safety profile of KYBELLA™ is well characterized. Most side effects were mild or moderate in severity, primarily associated with the treatment area and resolved without intervention. Side effects may include swelling, bruising, pain, numbness, redness or formation of areas of hardness. Dr. Wise use of KYBELLA™ is customized to the patient’s aesthetic goals for an improved chin profile. Many patients experience visible results in two to four treatment sessions spaced at least one month apart. Up to six treatments may be administered – 59% of patients received all six treatments. KYBELLA™ is administered by injections into the fat under the chin. Once the aesthetic response is achieved with KYBELLA™, re-treatment is not expected. KYBELLA™ is a non-human and non-animal formulation of deoxycholic acid, a naturally-occurring molecule in the body that aids in the breakdown and absorption of dietary fat. When injected into subcutaneous fat, KYBELLA™ causes the destruction of fat cells. Once destroyed, those cells cannot store or accumulate fat. Each in-office treatment session is typically 15-20 minutes. For most patients, downtime was minimal and occurred most commonly after the first treatment session. 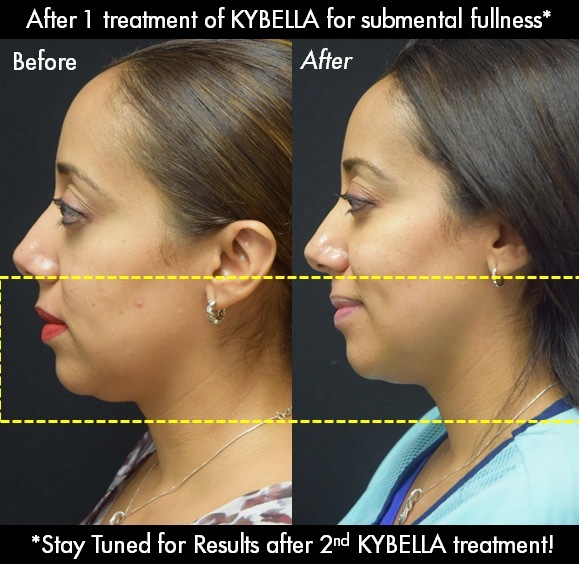 Can KYBELLA™ be used to eliminate fat in other areas of the body? Is it a potential treatment for obesity or alternative to liposuction? KYBELLA™ is only indicated for improvement in the appearance of moderate to severe convexity or fullness associated with submental fat in adults. The safe and effective use of KYBELLA™ for the treatment of subcutaneous fat outside the submental region has not been established and is not recommended. What is the recommended dosage for KYBELLA™? 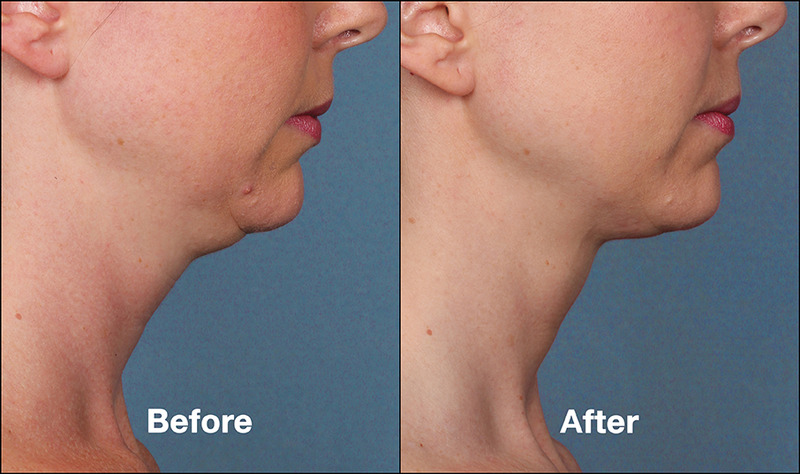 Treatment with KYBELLA™ is customized by Dr. Wise to the patient’s aesthetic goals for an improved chin profile. 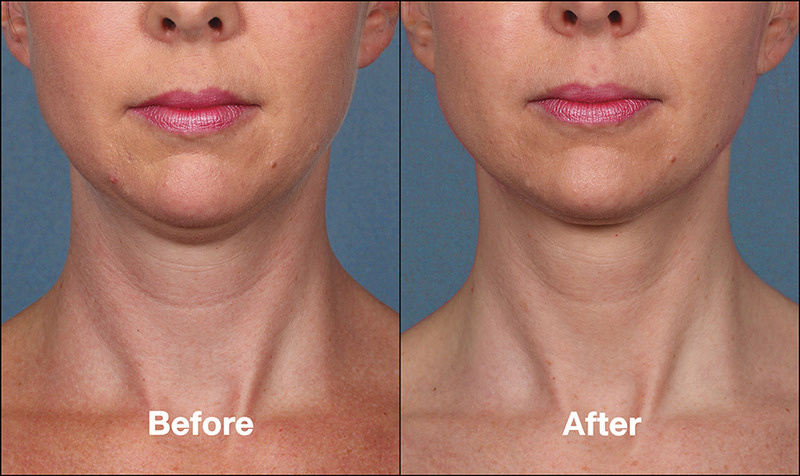 KYBELLA™ is administered by injections into the fat under the chin. In clinical trials, the average dose is approximately 4 to 6 mL delivered in 0.2 mL injections spaced approximately 1 cm apart per treatment session. Each in-office treatment session is typically 15-20 minutes. Many patients experienced visible results in two to four treatments. Up to six treatments may be administered. Once the aesthetic response is achieved with KYBELLA™, re-treatment is not expected. Most adverse reactions were mild or moderate in severity, primarily associated with the treatment area and resolved without intervention. In clinical trials, the incidence and severity of most adverse reactions decreased with subsequent KYBELLA™ treatments. The most common side effects are swelling, bruising, pain, numbness, redness and formation of areas of hardness around the treatment area. The number of injections and the number of treatments should be tailored to the individual patient’s submental fat distribution and treatment goals. In clinical trials, the average dose is approximately 4 to 6 mL delivered in 0.2 mL injections spaced approximately 1 cm apart per treatment session. Each in-office treatment session is typically 15-20 minutes. Many patients experienced visible results in two to four treatments.